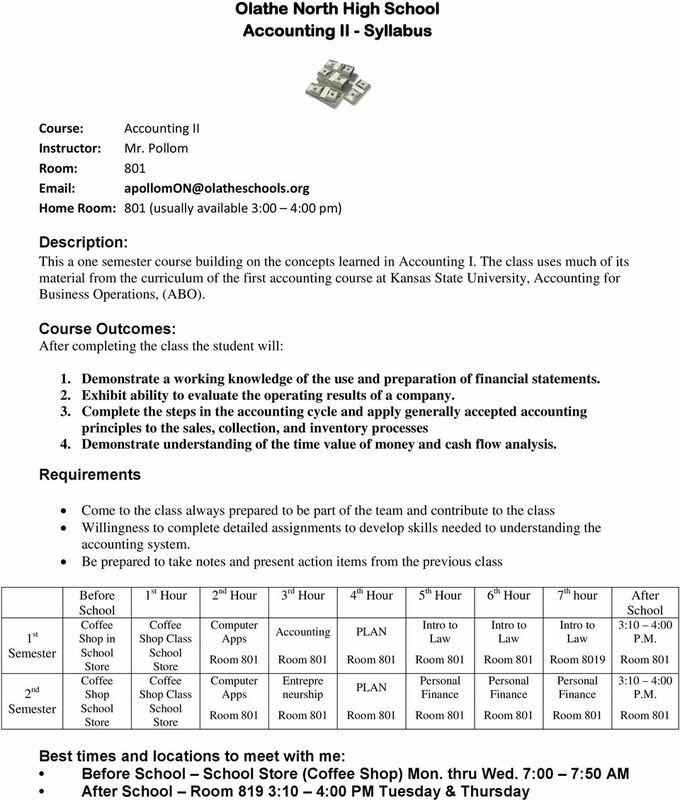 Download "Olathe North High School Accounting II - Syllabus"
5 Turning in assignments: Turn in your complete work in the tray labeled for your hour (e.g. 6th hour) on the table by the door. 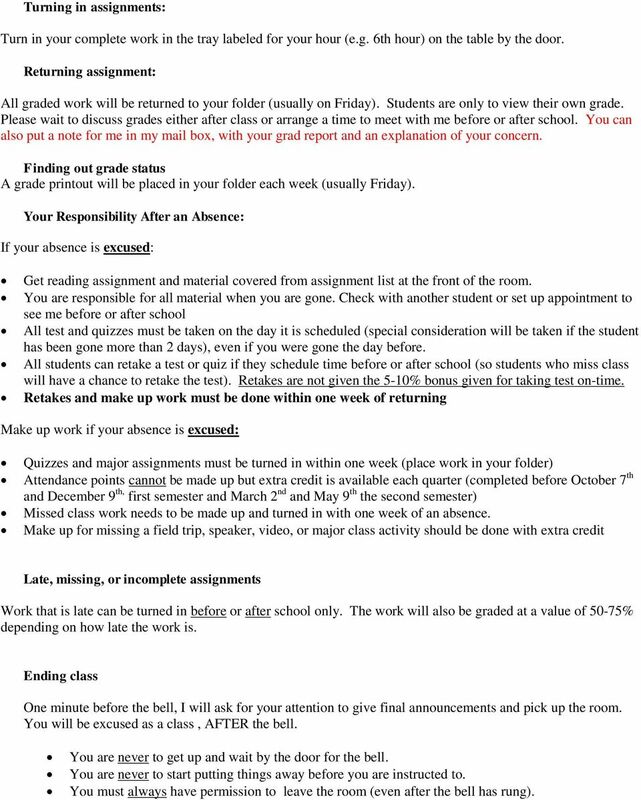 Returning assignment: All graded work will be returned to your folder (usually on Friday). Students are only to view their own grade. Please wait to discuss grades either after class or arrange a time to meet with me before or after school. You can also put a note for me in my mail box, with your grad report and an explanation of your concern. Finding out grade status A grade printout will be placed in your folder each week (usually Friday). 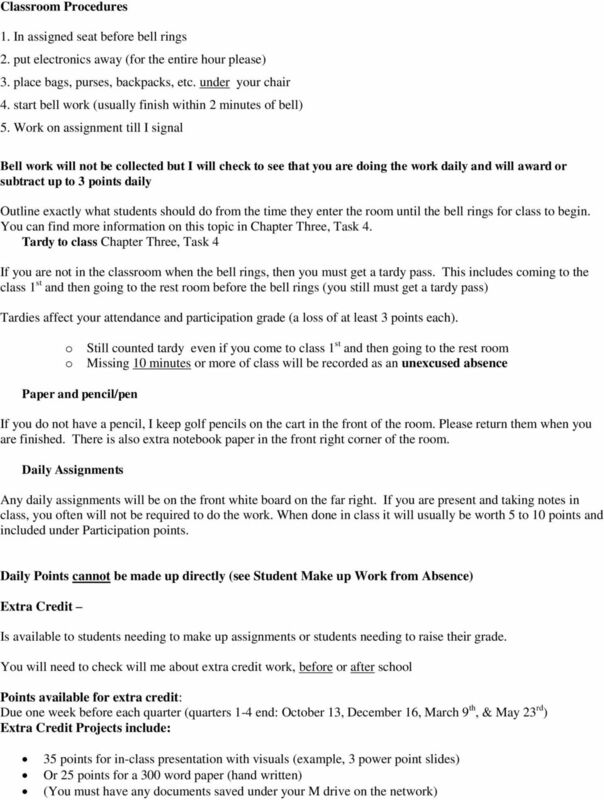 Your Responsibility After an Absence: If your absence is excused: Get reading assignment and material covered from assignment list at the front of the room. You are responsible for all material when you are gone. Check with another student or set up appointment to see me before or after school All test and quizzes must be taken on the day it is scheduled (special consideration will be taken if the student has been gone more than 2 days), even if you were gone the day before. All students can retake a test or quiz if they schedule time before or after school (so students who miss class will have a chance to retake the test). Retakes are not given the 5-10% bonus given for taking test on-time. 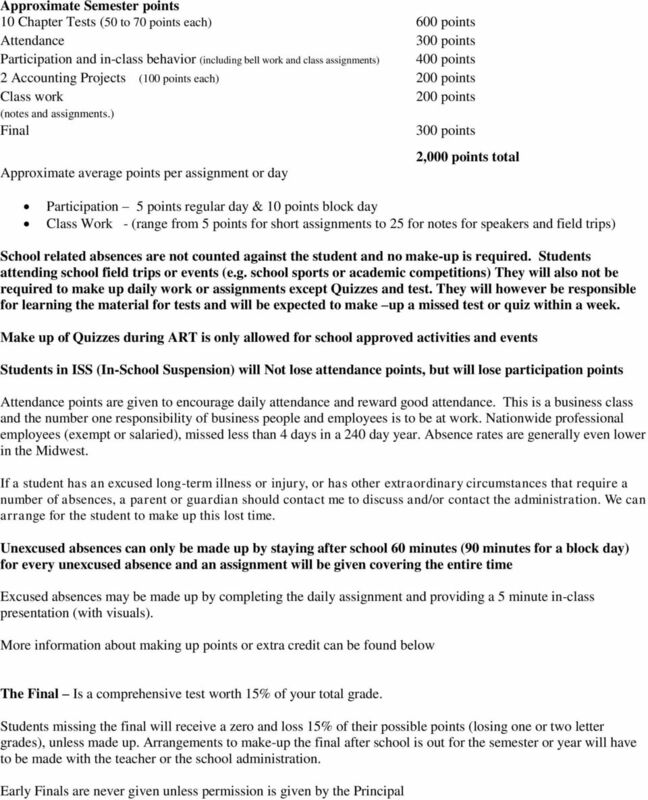 Retakes and make up work must be done within one week of returning Make up work if your absence is excused: Quizzes and major assignments must be turned in within one week (place work in your folder) Attendance points cannot be made up but extra credit is available each quarter (completed before October 7 th and December 9 th, first semester and March 2 nd and May 9 th the second semester) Missed class work needs to be made up and turned in with one week of an absence. Make up for missing a field trip, speaker, video, or major class activity should be done with extra credit Late, missing, or incomplete assignments Work that is late can be turned in before or after school only. The work will also be graded at a value of 50-75% depending on how late the work is. Ending class One minute before the bell, I will ask for your attention to give final announcements and pick up the room. You will be excused as a class, AFTER the bell. You are never to get up and wait by the door for the bell. You are never to start putting things away before you are instructed to. You must always have permission to leave the room (even after the bell has rung). 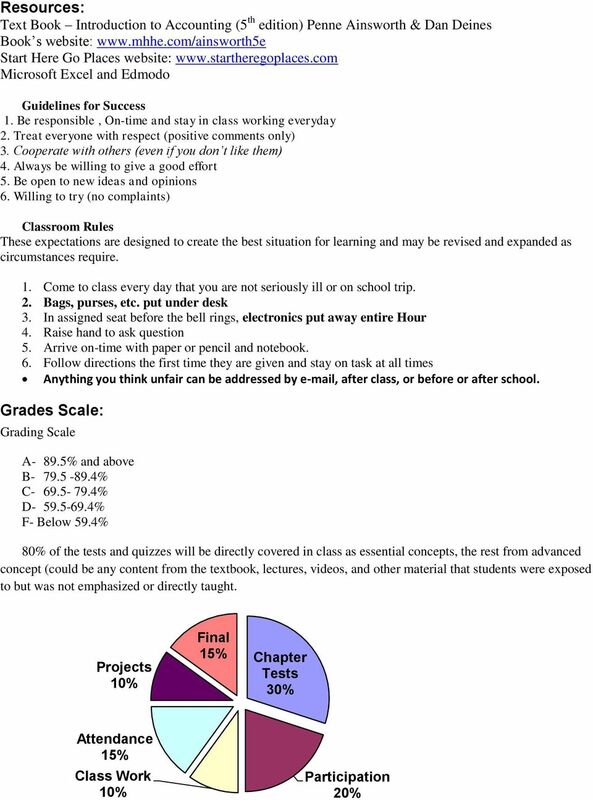 6 Consequences for Classroom Rule Violations If you violate a rule violated, you will be assigned a consequence. Depending on the seriousness and the frequency of the misbehavior, will receive one of the following (usually in this order): 1. Loss of participation points 2. Change in seating assignment 3. Discussion with me after class 4. Meeting with me before or after school 5. Parental contact 6. Contact with your coach or activity sponsor 7. Time owed before or after school (in 15 minute increments) 8. Office referral If you ever feel that the enforcing of the rules and consequences is unfair, you have the right to make an appointment to discuss the situation. IMPORTANT NOTICE. This syllabus is provided only as an example of what you might find in my sixteen-week lecture course.